HostingPalvelu Review 2019: Is HostingPalvelu a Good Hosting? 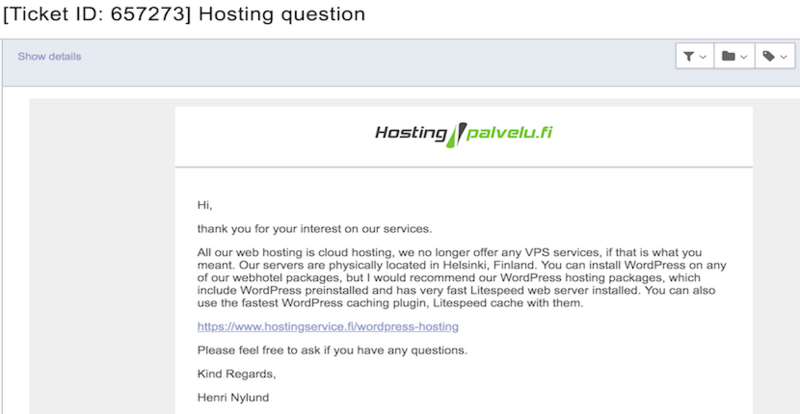 Finnish web host, HostingPalvelu, provides cloud website and WordPress hosting. Its plans include SSD and a free SSL certificate, and it has served over 17,000 customers. The website is primarily in Finnish. Based in Finland, HostingPalvelu specializes in shared website and WordPress hosting as well as domain registration. It has over 17,000 customers and over 32,000 domains registered. It maintains a AAA credit rating and all of its hosting uses cloud technology and SSD storage. The data center is in Helsinki, Finland, the main area of the website is in Finnish, and the shopping cart area is in Finnish and English. HostingPalvelu offers two main types of hosting; regular website hosting and WordPress hosting. The entry-level Starter web hosting plan includes: 1GB of SSD storage, one MySQL database, and 10GB of monthly bandwidth for one domain. Stepping up one level, the Basic plan comes with 4GB of SSD storage and 40GB of monthly bandwidth for up to five domains. For a fast WordPress experience, customers may opt for one of the WordPress hosting plans. These plans come with an optimized WordPress version pre-installed, fewer customers per server, LiteSpeed web server, and the LiteSpeed Cache plugin. The starter WP1 plan includes: 80GB of monthly bandwidth, up to roughly 50,000 website visitors, one CPU, 1GB RAM, and 10 email accounts. For higher traffic WordPress websites, the WP3 plan includes 400GB of monthly bandwidth for roughly 500,000 website visitors. Another way HostingPalvelu boosts website loading speed is by use of a CDN, which is available at an additional monthly fee. This content delivery network is spread across Europe, South America, Australia, Asia, and North America. Features include: HTTP pull, HTTP prefetch, HTTP purge, hotlink protection, password protection, and the ability to restrict delivery by country. Pricing for HostingPalvelu website cloud hosting plans start around, or at just less than, the cost of a fast food meal per month. For this price, customers will get a small amount of SSD storage and bandwidth for one domain. WordPress hosting costs around double that price but includes eight times the monthly bandwidth and LiteSpeed Server as well. 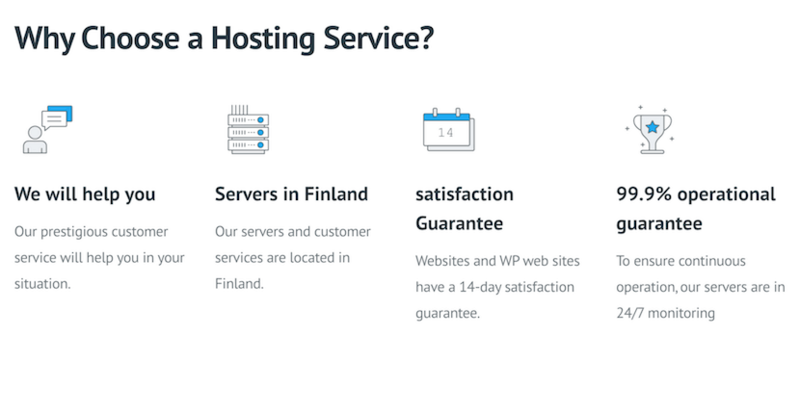 Compared to other Finnish web hosts offering similar features, HostingPalvelu’s pricing is around average for basic website hosting and priced below other top providers’ WordPress optimized plans. These prices are similar to top international hosting providers who offer SSD, free SSL, CDN, and LiteSpeed Cache. Hosting plans can be purchased quarterly, semi-annually, annually, or biennially with discounts for longer term lengths. Compared to a quarterly term plan, semi-annual plans cost around 9% less, an annual plan is roughly 19% less, and biennial plans save around 28%. Customer service is provided by email, telephone, and live chat. Email customer service is available from 8:00 a.m. -10:00 p.m. and telephone support is staffed from 8:00 a.m. – 4:00 p.m. I reached out to sales support via email and received a reply within a couple hours. HostingPalvelu is a Finnish hosting provider specializing in cloud hosting, both in normal website and optimized WordPress plans. The pricing is competitive considering that SSD and SSL are included and the WordPress plans include LiteSpeed Cache as well. Plans also come with a 14-day money-back guarantee. Wondering how HostingPalvelu stacks up against other Web Hosting companies? Enter any other Web Hosting company and we will give you a side-by-side comparison.